Come experience a vacation steps from the beach with a level of privacy rarely found along 30A. 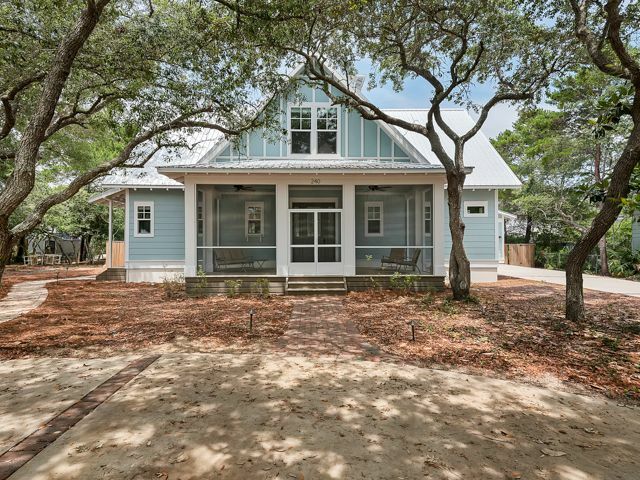 Built in 2014, this casually elegant, custom built beach cottage offers comfortable, open concept living complete with hardwood floors and a stone fireplace under a large screen TV. The gorgeous kitchen includes granite countertops, walk-in pantry and a 5-burner gas stove. The dining area is furnished with an oversized, solid wood table and 12 chairs. The kitchen bar provides additional seating. An elegant master suite is located on the first floor. A half bath and laundry room complete the first floor. Easily accommodating multiple families, upstairs are four bedrooms, 2 built-in hall bunks and 2 full baths. The second floor has access to an observation tower above the trees with spectacular views of the gulf and Eastern Lake. There are TVs in each bedroom and wireless internet throughout. The house offers 2 large screened porches. The front porch is nestled in the shadow of the live oaks. The expansive back porch overlooking the newly constructed pool** and the privacy fence creates a hidden oasis. The driveway and separate circular drive provide ample parking for multiple cars. The house is approximately 250 yards from beach access and access to Eastern Lake for kayaking, fishing and paddle boarding and is in close proximity to restaurants and shopping. Spring through Fall only (weather permitting). * Parking for 7 cars. Thanks for the review! We hope to see you back soon!